I'm slowly but surely finding the animal within me (see my August blog, The Marmite effect). And, unlike a leopard, I'm changing my spots - or rather I'm embracing them. Which is how I found myself with this leopard-print cardie from M&S's Limited Collection. It's loud and rather un-me, but I like it. And it was a bargain in the store's mid-season sale (they're starting everywhere, with M&S's beginning this week), down from £25 to just £12. Colour is the way to wear animal print this season - the brighter, the better. I'm taking my lead from Christopher Kane's s/s 2009 collection, where leopard-print cashmeres were served in cheerful colour combos; my favourite was orange and yellow, which has surely influenced my penchant for red. 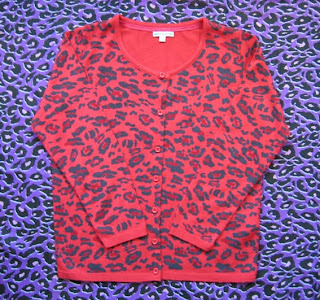 In fact, I'm after a pair of red leopard-print leggings next (though not to wear with the cardie - that would be too OTT). I saw a shop assistant wearing some Topshop ones and they looked really cool. Sadly, they were seasons old. I also spotted a pair on the tube that would have been perfect for a beginner like me. With baby leopard spots in grey on a paler grey background, it said animal print without being too shouty. I asked the wearer (who had teamed hers with cute shoe-boots) where they were from. Uniqlo it turns out. Yay! But, after traipsing to four different stores, it seems they were on sale weeks ago. Boo! I guess I should have jumped onboard this animal trend a whole lot earlier. But how was I to know that I'd learn to love leopard print? As it is, we're still in the courting stage! Btw, this is my neighbour's cat, Rose. 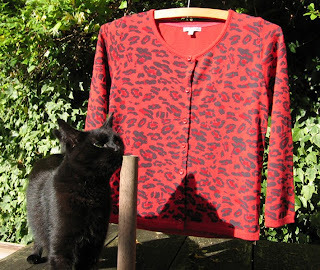 She had a liking for leopard print, too, when I was trying to take photos in the garden this afternoon!